We've seen a lot of talent in the short month that we've been running our new web series "Aca Live." From established groups whose roots date back decades to newer groups who are tearing up the East Coast scene and making a name for themselves. Rounding out the month of February, we're heading to warmer weather in Arizona for the youngest group to ever be featured during our "Aca Live" segment. Let us introduce you to The Devil Clefs from Arizona State University. Having only been active for less than two years, the group seems to be finding their way with relative ease from an appearance at this year's ICCA to a promotional event with Universal for "The Voice" (yes, the TV show). Learn more about them in our interview with The Devil Clefs below and be sure to tune-in to our Facebook Page this Monday, Feb.
27th at 7:30 PM/MST to see them perform LIVE! The Devil Clefs were founded in the Spring of 2015 by AJ Perez, Katie Leavitt, and Mark Quiñones. The group started because both Katie and AJ auditioned for different a cappella groups, but were both turned away from their top choices, so they decided to form their own with the help of Mark. Because we are still new, we’re still trying to figure out our sound, however, our first song that we performed was The Longest Time by Billy Joel. It was the first song that ever clicked for us and sounded awesome, so I would say that that particular song and style has had a lot of influence over our style. Our group’s focus when it comes to songs we perform right now would be variety. We have a lot of different voices within our group, so we definitely pull from a variety of genres and styles to create arrangements that best show off the talents present in our group. For example, one of our favorite songs to perform and sing is Come On Eileen by Dexy’s Midnight Runners (in which we incorporate a little bit of The Longest Time) and another one would be Alive by Sia. 3. 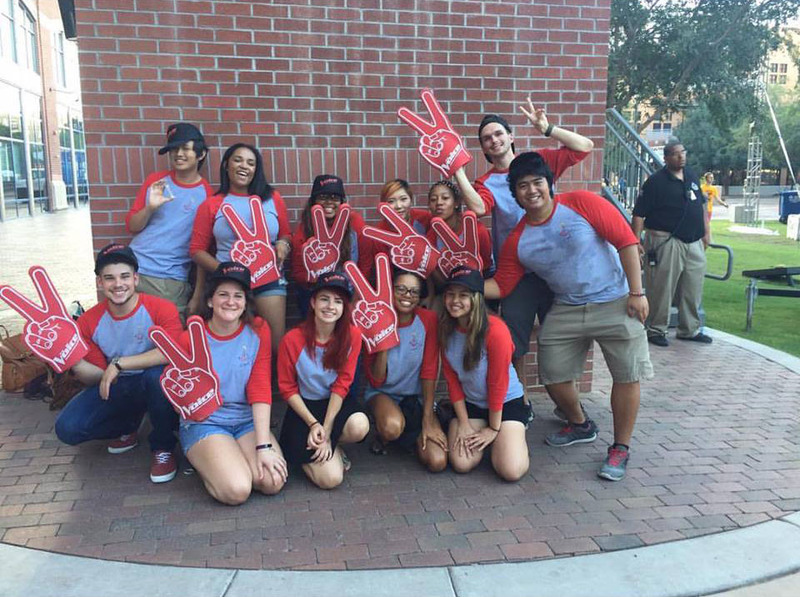 The Devil Clefs currently share the Arizona State University campus with various other a cappella groups. How does the group differentiate itself from these other groups? What makes the group so special? While we share our campus with many other a cappella groups, we have to say that they are all like family to us. We absolutely love The Pitchforks, Priority Male, and The TEMPEtations with all our hearts. I believe what makes us different is that a majority of us don’t have a major or minor that has to do with music, except for one member. We’re special because we’re a very diverse group of people coming from a bunch of different backgrounds, and yet with all our differences, it feels as if we’re a family rather than a couple students who just sing together. We currently don’t have any big projects we’re working on. Like I said, we’re still new, so we’re just trying to have fun with what we do and learn how the a cappella community works. Recently, we’ve been reaching out to many charities and organizations like Phoenix Children’s Hospital, PBS of Maricopa County, and many others hoping to partner and start a philanthropy with them. 5. This past year you all partnered with Universal Pictures to help promote "The Voice." Can you tell us a little about how you all got involved with that and what you remember most about the experience? Promoting for The Voice was a whirlwind. An intern/campus representative from Universal Pictures reached out to The Devil Clefs at the beginning of the semester to promote for The Voice, and within a week and a half, we were performing a song our music director (Mark Quiñones) arranged on stage at Devils on Mill, which is a giant tailgating event before football games. It all happened so fast that it was hard to take in the whole experience. I think what we remember most about the experience is that we gained so much recognition so quickly into the semester, which was awesome. 6. What are some things the Devil Clefs like to do outside of music that contributes to your musicality? A lot of us are heavily involved in the choir community at ASU (Gospel Choir and Women’s Choir). One of our members, Mark, is in our university’s band and is a trumpet minor too. Two of our members, Kayla and Jeffrey, are both theater minors, and Jeffrey plays guitar and is in the process of creating an EP. Our only freshmen member, Mia, is an art major with a drawing concentration, and another one of our members, Halline, is a digital arts major. Two of our members, Megan and Skylar, both went to an arts high school in Southern California together, where they majored in commercial voice and musical theater. So while none of us really major in music or anything related to music, we all have some sort of background in the arts that fuels our creative spirits and contributes to our group as a whole. It’s a really awesome atmosphere. 7. What do you think about the current state of a cappella? Do you feel groups like yours get enough attention? Do you ever struggle in getting attendance to performances? Too much competition in the collegiate space? We’ve only been around for a couple years, so it’s safe to say that we’re all still learning the ropes when it comes to a cappella. Our biggest project this year was to kill it at ICCA, and although we didn’t advance to semi-finals, we are still super proud of all we have accomplished. I guess our big plans for the future include just working on our music and keep trying to do our best. Now that we’ve established ourselves in our community, we definitely would love to collaborate with other groups. Actually, our VERY first performance was at a concert for The TEMPEtations. They reached out to us and asked if we would be willing to sing a song, and of course, we said yes! Keep in mind that our group had probably only existed for a total of 3 months, so we barely had any experience under our belt. While we were singing a mashup of a bunch of different love songs, somehow half the group skipped to the end of the song, and we were all off. It was so embarrassing at the time, but looking back on it is hilarious because it only shows how much we’ve grown from then to now, where we’re hosting our own concerts and participating in ICCA and festivals. 10. When you consider the fact that you are one of many vocal groups at Arizona State University, both a cappella and other choral groups sponsored by the university, what is it like trying to convince new talent to join The Devil Clefs versus another campus group? To be quite honest, we really don’t have trouble convincing new talent to join The Devil Clefs. A lot of us are interspersed in the various choirs on campus, so when we talk to them about The Devil Clefs, they’re more than happy to check us out. But what I’ve learned is that a lot of people who audition for us also audition for the other a cappella groups, and it’s not really a matter of convincing them to join our group versus their group. It’s more about where you feel like you belong. All the a cappella groups are so different, so when we accept someone into our group, we look at talent of course, but we also want to make sure our new members feel like they belong in our family. Originally, this group started because a couple people just wanted to have fun and sing with each other. For the first year, that’s all we did. We had fun, we sang, and we got involved in as many things as we could. Now, going into our third year of the group, we definitely do take ourselves much more seriously, but we’re still just a group of people who want to sing with each other and have fun, and I think that’s why we think of each other as a family. The friendships we’ve made in this group are friendships that will last a lifetime. 12. Lastly, could you give us some background on the below photo from your Instagram account? What was the event, how'd you get involved, what was memorable about it, etc.? So every semester, Arizona a cappella puts on a festival called AZAF (Arizona A Cappella Festival) or AZCAF (Arizona Collegiate A Cappella Festival). During the weekend of AZAF, multiple a cappella groups from all over Arizona (high school, professional, and collegiate) get together to work with each other and give workshops or lessons about the technicalities of a cappella. For example, there will be ICCA specific workshops, workshops for arranging, beatboxing, blending, marketing, and everything you could imagine in a cappella. AZCAF is essentially the same thing, but it only involves the collegiate a cappella groups from University of Arizona, Northern Arizona University, Grand Canyon University, and of course Arizona State University. In that particular photo, we had all just performed and showcased our favorite arrangement for each other and decided to take a photo before we dispersed into the different workshops of the day. For more information on The Devil Clefs, and connect with them on Facebook, Twitter, Instagram and YouTube.